The Tbilisi public transport system is vast and often complicated. However it covers an extensive amount of the city and once you get the hang of it there are so many easy options for getting around Tbilisi. The city is quite spread out and while the old town is walkable, lots of the more affordable accommodation is located further out. There are also plenty of interesting things to see in Tbilisi outside of the old town. Once you’ve got the gist of the transport options check out our complete guide of things to do, eat and see in Tbilisi. The metro system in Tbilisi is one of the easiest ways to use the public transportation in Tbilisi. The metro system of Tbilisi is a typically efficient Soviet-era system. You’ll need to purchase a card (2 GEL) and load it with credit, this can be done at every metro station. One ride costs 0.5 GEL and you can use one card for multiple people. There are 2 lines which stretch across the city and are useful for getting to places such as the train station or Rustavali Avenue. Trains come every 3-5 minutes and can often be very full. Tbilisi metro system map, for easy public transport in Tbilisi. Tbilisi has a bus system that is easy to use but is often overshadowded by the mini-buses which are faster and cover more places. But the buses can be used with the same card as the metro and also cost 0.5 GEL. Google Maps shows bus numbers that go to each bus stop in the city and if you click on the number it shows you the other stops on the route. Plenty of bus lines make the Tbilisi public transport very sufficient and easy to reach even further away places of interest. There are two bus types in Tbilisi, the smaller, yellow un-air-conditioned and the larger, new, blue ones with air-conditioning and comfortable seats. Most major routes now have the new buses. The most useful bus is number 37 which takes you to and from the airport and is far cheaper than any taxi. Check here for routes and schedules. Marshrutka or mini-buses are the most authentic part of the Tbilisi public transport system. All locals travel with these mini-buses, which are a big part of the public transport in Tbilisi! The mini-bus network in Tbilisi is the most comprehensive system but also the most confusing. They often don’t run to a schedule and it can be difficult to find the right stops and routes. Rides cost between 0.8 and 1 GEL and can be paid using exact change (pay the driver when you leave) or a Metro Card. I recommend working out a couple of routes that will be useful e.g to get home and use a taxi to go to new places. You can check all routes at the official Tbilisi Minibus website (click English in the top right corner). On busy days the vans can get very full and hot! 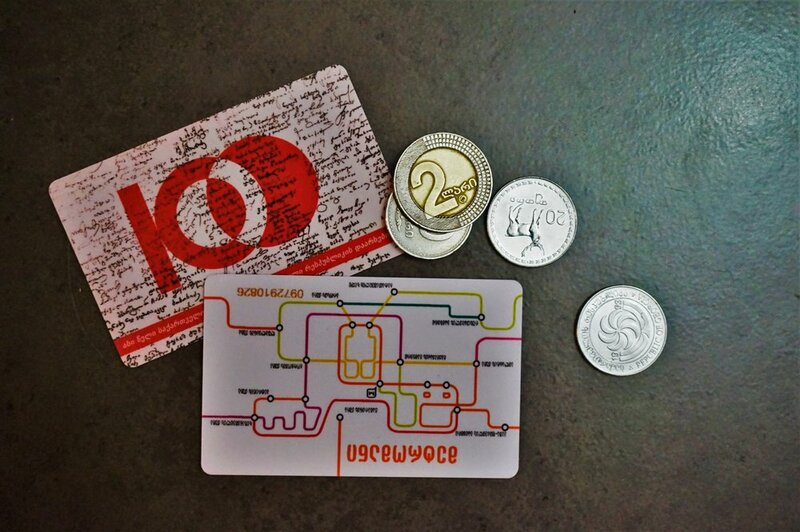 Nowadays you can use these handy Tbilisi public transport cards, to make the payment a lot easier. Taxis are very affordable in Tbilisi but the driving can be questionable. There are no shortage of taxis in the city and standing on the side of the road will result in one pulling over in a matter of minutes. Fairs are negotiable so make sure you set it before you get in. Due to the increase in tourism in Tbilisi many taxi drivers take advantage of tourists and charge overpriced rates. As a general rule, it shouldn’t cost more than 7 GEL anywhere in the city. Because of the hassle of negotiating we often use a taxi app to order taxis. It’s cheaper and easier but requires a Georgian sim card (easy to pick up and worthwhile if you’re there for any more than a few days). The most popular apps are Yandex and Taxify. Both apps make it easy for non Russian/Georgian speakers as you input your location and destination and the price is given. You pay in cash when you arrive at your destination – easy! 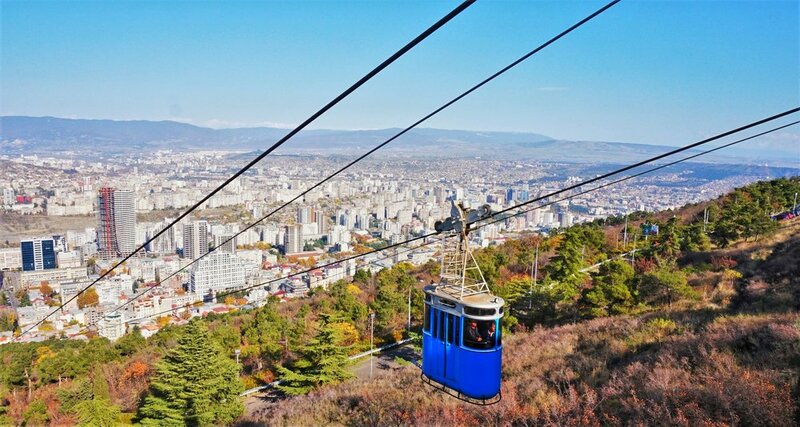 Tbilisi has several cable cars taking both tourists and locals to viewpoints and attractions around the city. The most widely used by tourists is the one running from Rike Park to the Narikala Fortress. To use this cable you need to have a public transport card (same as for the metro) a one way journey costs 0.5 GEL. With the metro card you can also use the small cable car from Vake Park to turtle lake which is a pleasant place to enjoy a stroll. There are some very interesting parts about the Tbilisi public transport system too! The third cable car (technically a funicular) goes up to Mtsminda Park which has a fun park, cafes and amazing views of the city below. You can take bus number 124 or 90 to the top but to ride the funicular you will need a different travel card. The card costs 2 GEL and is also used to pay for any rides at the fun park. The trip up to the park costs 2 GEL per person. Tbilisi is a great city for walking as everything is reasonably close together. The old town especially is a great place to wander and many of the streets are pedestrianised. There are secrets to be discovered around every corner in Tbilisi so it’s well worth to spend some time getting around on foot!